The history of Ireland is rich in storytelling. One of the more formidable events of the 20th Century serves as the catalyst for a bar reunion in Owen McCafferty's Quietly, presented by Irish Repertory Theatre in association with The Public Theater. The Irish love stories and Quietly is a one-act of telling a story of the past when two men gather in an empty bar in hopes of hashing out the past. This is a play that lived in pauses. And mostly naturalism. A man named Jimmy walks into a bar. He drinks a pint, watches some football. He tells the barkeeper that he’s waiting for someone. It’s ominous. Who is this person? What are they meeting for? A short time passes when a man named Ian walks in. There’s a brief exchange of niceties until Jimmy head butts Ian. The action begins. Quietly is a play about two men who must reconcile with the past in order to move forward in the future. The burning question of the play is why was this the right moment for these men to meet. Why this place at this time? While it’s never quiet solidified, that’s not what moves this play. It’s the McCafferty’s ability to tell a story. His writing is graphically descriptive. There’s a lot of texture within the nuance of words. Where Quietly seemed to waver was in the direction. Jimmy Fay, for the most part, kept with the naturalistic genre but the bits of stylized staging mixed with the truly natural drama was mystifying. The scenic design by Alyson Cummins features a real game machine. The tap spews beer. But the television? It’s not there. And it confused Fay’s vision. Fay placed the imaginary television in the audience. It forced Patrick O’Kane and Robert Zawadzki to speak out and not to one another. It felt a bit strange. With the pillar likely being a factor into the placement and angle of the bar, it too altered some staging choices. But for a naturalistic piece, the biggest blaring problem was the sound. Sound designer Philip Stewart found a football match that played on the imaginary screen. It was there, at a low volume, for when Jimmy and Robert interacted. But when Ian arrived, the sound of the game completely disappeared. Sure, the silence was necessary but in a world of naturalism, how the hell did it disappear if Robert never used a remote? Sure, it’s a little thing but it has to be scrutinized for the big picture. 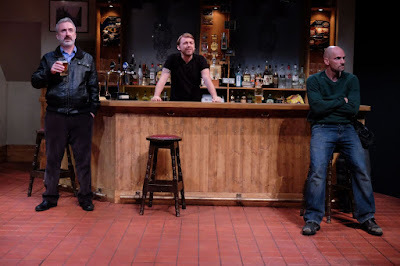 With three people on stage, the prime focus was on Declan Conlon as Ian and Patrick O’Kane as Jimmy. It was their nascent relationship that drew attention. Both Conlon and O’Kane tapped into the emotional core to pull out raw and gritty performances. The gamut of sentiments controlled the journey. But when it came to Robert Zawadzki, he was relegated to being a prop. He stood behind the bar and lacked any semblance of emotion. No shock. No anger. No wariness. Zawadski’s Robert was stoic. Sure, the focus was on the other two but someone will have an eye on him. If you can get past the slug-like pacing and are intrigued by how history informs the future, Quietly is for you. It’s a well thought out production but for those who like action, you will be bored. I’m one of those. When a falling program from the balcony hitting the only empty seat in the orchestra is the most exciting thing to happen during the show, this may not be your cup of tea. But you have to respect the production because it knows what it is.